With a population of over a million residents, Contra Costa County is the ninth largest county in California. Such a large population means a lot of work for the public works department, which is responsible for services such as construction, maintenance and improvement of infrastructure within the unincorporated county and the flood control district as well as county buildings and grounds. Since each of the jobs performed by the department’s many divisions requires the submittal of a paper report or form, the department is overwhelmed by paper and file cabinets. The department wants to hire new staff but there is no place to put their desks. With no department-wide retention policy, documents are kept indefinitely, contributing to the overwhelming amount of paper and records management challenges. 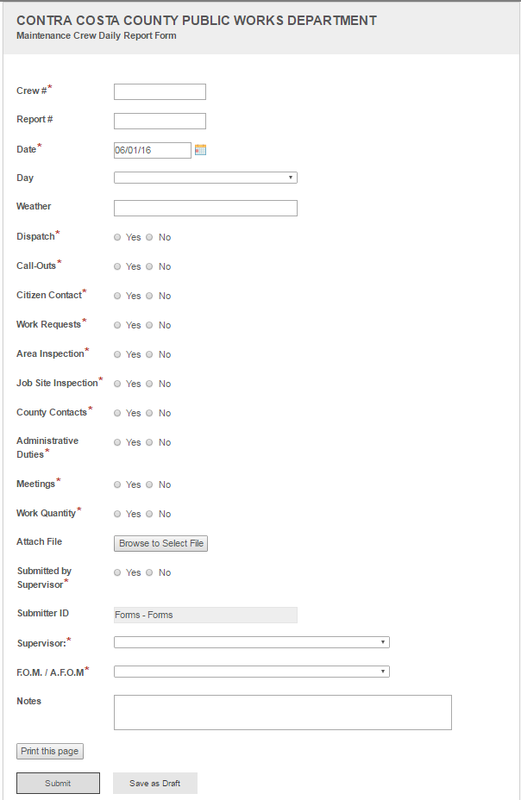 The public works department is beginning to scan documents into Laserfiche and automating key processes in different divisions by implementing Laserfiche Forms and Workflow. Here is how the maintenance, flood control and environmental divisions are using Laserfiche to go paperless. The maintenance division deploys crews to do each day’s required maintenance around the county. Some examples include pavement repairs, road signage and striping installation, creek bank repairs and weed abatement. At the end of the workday, each maintenance crew supervisor must file a daily report that outlines all of the work performed that day. This report used to be a Microsoft Word document which would be filled out, printed out, submitted to the supervisor for review and signature, and then stored indefinitely in a file cabinet. Now, the entire report is completed in Laserfiche Forms. At the end of each day when they return to the office, maintenance crew supervisors fill out an electronic report form. The form has been made dynamic through the use of field rules, making the reporting process faster and easier. Certain sections appear only when a particular selection is made. For example, if the Dispatch field is marked “Yes,” then a field appears asking for a description of the dispatch. Once submitted, the report is sent to the supervisor for review. He can approve it or send it back to the submitter with a request for more information. Approved reports are stored in the Laserfiche repository. 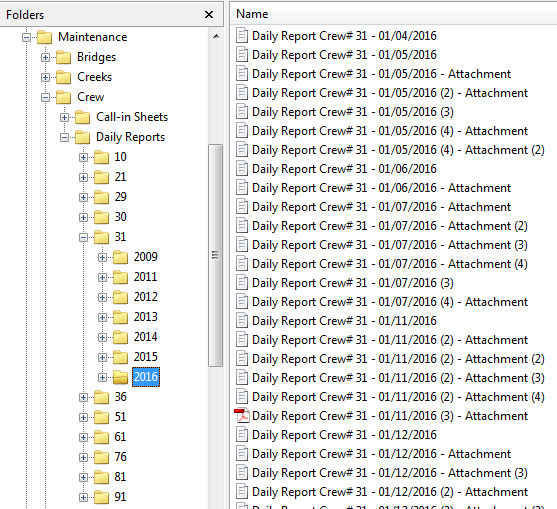 Approved daily crew reports are stored in the Laserfiche repository. The flood control division receives requests from other county departments and cities to review project applications. A clerk will log the request in a Laserfiche form, then assign it to an engineer. 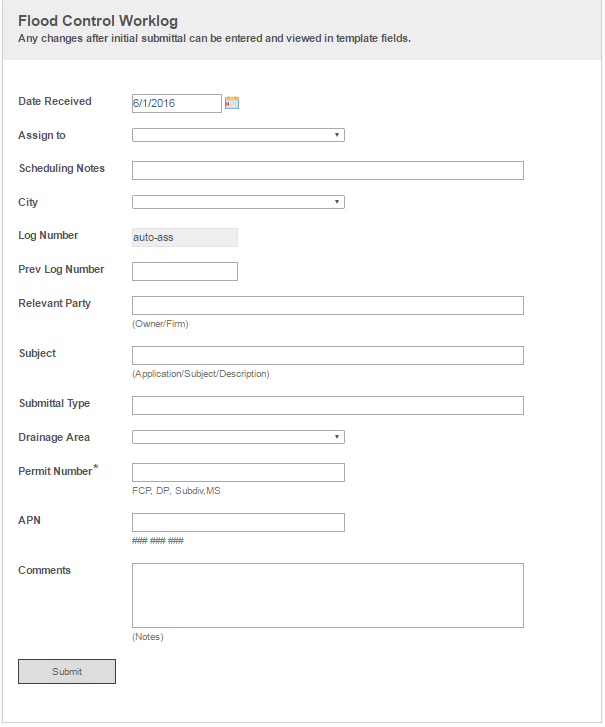 The flood control worklog electronic form. 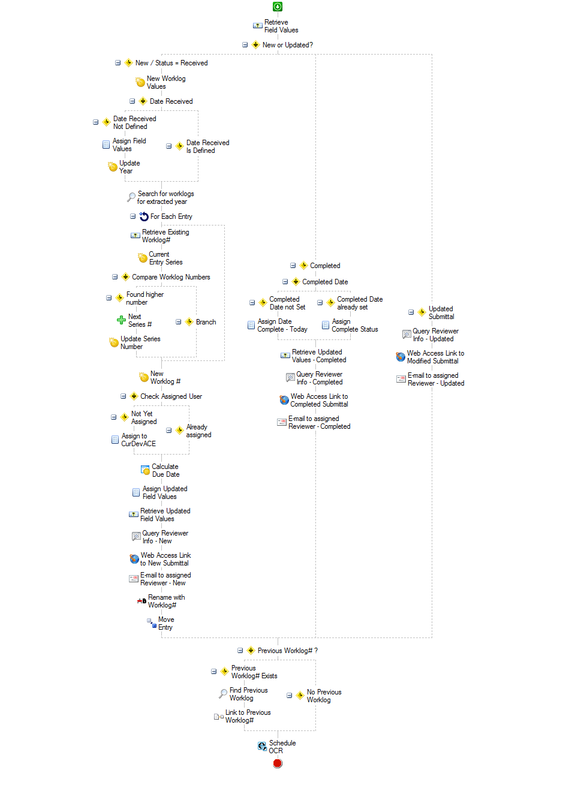 Once the form is submitted, a Laserfiche workflow is started. This workflow calculates the worklog number and project due date, then notifies the assigned engineer of new work to be completed through email. Once the work is done, Workflow sends an email to the clerk letting her know that the work has been completed. Before a project is started, the environmental division performs an environmental review. The division requesting the review fills out an electronic Request to Initiate Environmental Process form. Once the form is submitted, the environmental division manager is notified to review the request and select the staff member who will perform the review. The form is then saved in the repository. The request to initiate the environmental process electronic form. 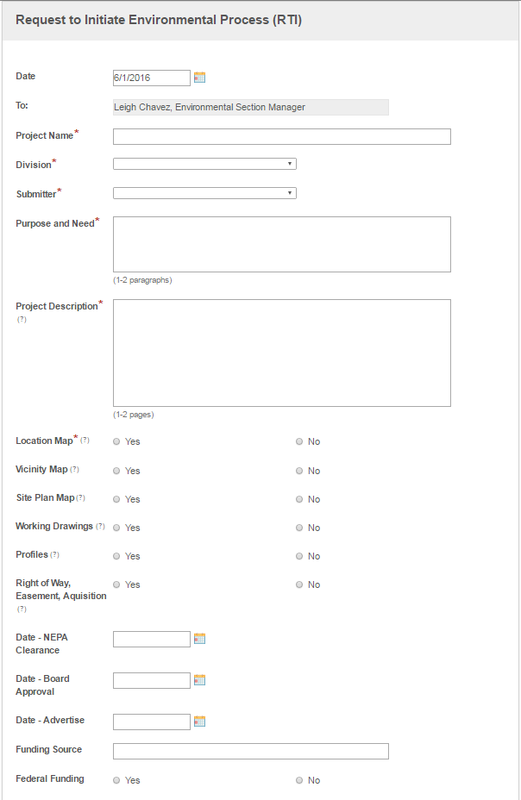 Once the form is submitted, Laserfiche Workflow notifies the assigned environmental planner of new pending work. When the planner starts the work, he or she changes the status in the form’s metadata from Assigned to In Progress. This triggers an email to the manager that the work has been started. When the work is finished, the planner changes the document’s status to Completed which triggers an automatic email notification to the manager. 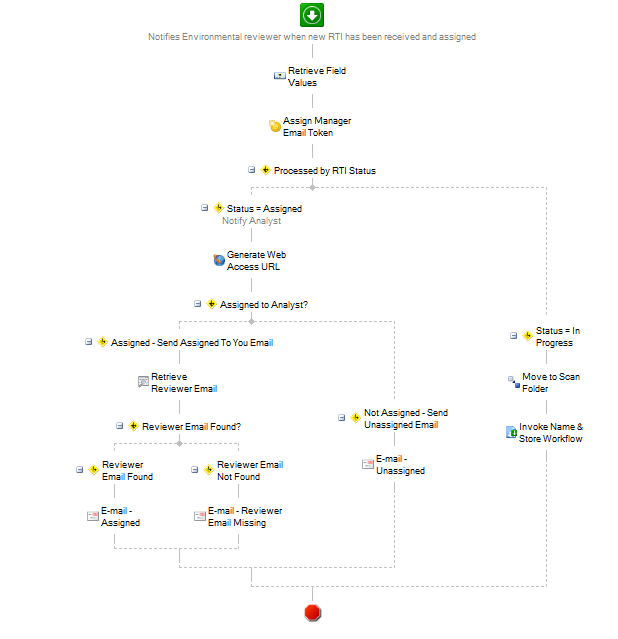 Laserfiche Workflow sends emails to the planner and manager. The department will have a standardized retention policy for all documents, allowing for the regular destruction of documents and eliminating the need for the department to keep paperwork indefinitely. The elimination of paper file cabinets will create more space, which will be used for desks for new employees. Information availability has increased, as a manager can now quickly run a Laserfiche search and see the status of all reports or projects in one view.